Looking for new ways to accelerate your volume business with SAP Business One Cloud? This article is for you. With the ongoing growth of SAP Business One on the cloud, more and more partners seek for a way to automate the process of tenant provisioning and avoid manual work. The concept in all these cases is the same – the partner provides the customers a web-based on-boarding process for the cloud environment and although the on-boarding process may vary between partners and solutions, the tenant provisioning part is similar. To save partners the effort of developing this generic part, SAP provides the “Tenant Configurator”, a component that partners can integrate into any on-boarding process. After the tenant is created, the customer completes the on-boarding process, receives an email from the partner with a link to the cloud environment, and can start working. Integrating the Tenant Configurator to the on-boarding process automates the process for both the customer and the partner. It allows partners to increase the volume of their business and accelerate the overall process. 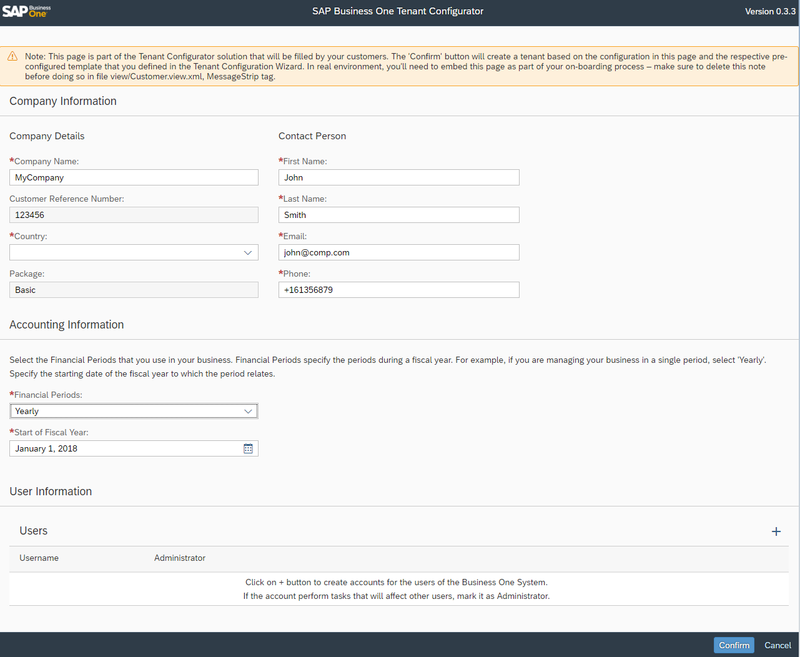 The Tenant Configurator consists of two main web-based user interfaces: an interface for the partner cloud operator for configuring the tenant provisioning parameters and an interface for the customer to configure their own business parameters. In the coming articles, I’ll dive into more details of how to best utilize the solution. In the meantime, you can download it and experience it.